The smoking ban came into force in England in 2007, banning smoking in all work places. 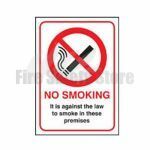 These no smoking signs are a great way to stop people smoking in your workspace and of course breaking the law. 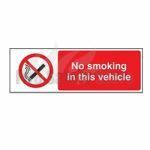 We have ‘no smoking on these premises’ signs and no smoking in vehicle signs, the latter are of particular importance since many people fail to realise transport is included in the ban. 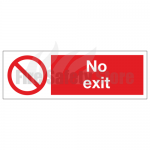 Also available are no exit signs to show staff and visitors that the exit should not be used. This sign is handy to use in the event of an emergency which could cause staff or visitors to use the wrong door but this sign will remind them not to. Our signs are clearly readable and they contain graphic diagrams for people who are incapable of reading. These signs also adhere to the Health and Safety Regulations so you can rest assured they meet the relevant standards. Our high quality signs are self-adhesive so you don’t require any other products to use these signs. Order before 2pm today and receive these products the next working day.